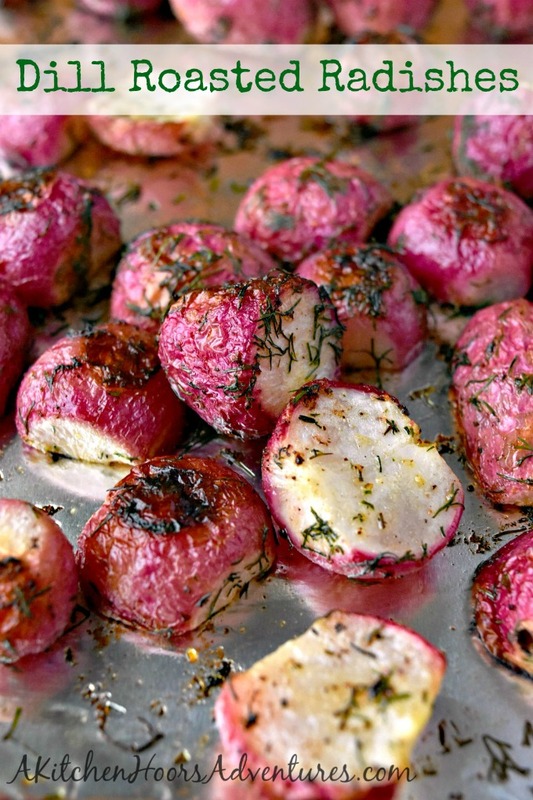 Roasting radishes changes their flavor completely! 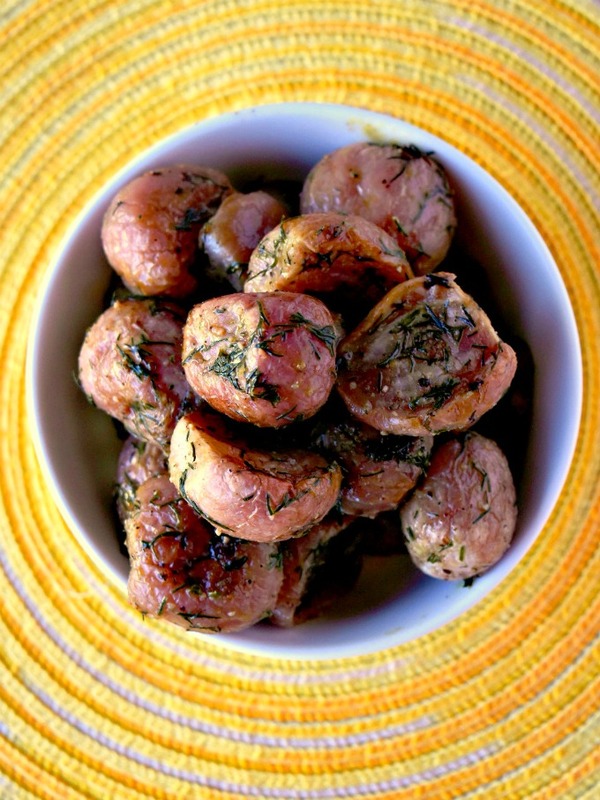 If you haven’t roasted radishes, then try these Dill Roasted Radishes for a different #Easter side dish. It’s day two of #EasterRecipes! Did y’all see my Deviled Ham Bites from yesterday? NO?? Then check them out. They’re so delicious and perfect little nibbles to tide your family over until the main event. Today, I’m doing something completely different. Not only am I posting a side dish. I know, insane! But I’m sharing a rather different side dish. I’ve roasted up some radishes. For some of you, this might be a standard side you have all the time. But for me, not so much. When I was traveling to Bogota, I had some interesting dishes that I’d never heard of or thought of before. I had squid ink pasta. Now, I’ve heard of it, but never thought I would have some. Ceviche that I loved. Again, never thought I’d love anything that was somewhat raw in the seafood category. Then there was that one time I went to the cafeteria in the embassy and grabbed what I thought was zucchini. Yeah. Not so much. It was cucumber. Cooked cucumber. Sautéed up like you do zucchini. Who knew people even did that!? I’ve never had nor even thought of cooking cucumbers like that. Then, last year at the Food and Wine Conference, Duda Farms served up some grilled vegetables for our Sunday breakfast. I grabbed a skewer because they looked delicious. Low and behold, there were grilled (or roasted) radishes on that skewer! It was like a light bulb went off. Why not roast them? They’re root vegetables! I bet they’d taste amazing if I did roast them. So, I did. And I was right!! For those that don’t like radishes because they’re spicy, when you roast them they’re not. They are totally mellow and have amazing flavor. You can still taste the radish, but it’s not as sharp and has not bite like some radishes can. They’re bright red the day you cook them, but if you give them a day or two before you photograph them they’re not as red. It was interesting to me to see the color fade. However, the flavor doesn’t fade. It does change slightly; they’re even more mellow if that’s even possible. I have never known a single ingredient to change so much from raw to roasted to leftovers. It just blows my mind. Now I wonder what other ingredients do that, too? What other produce or meats? Or fruits even! I can’t wait to perform some experiments in my kitchen finding out. If they all turn out as delicious as these are, then I’m totally excited!! Just look at that color and those flecks of dill. Why dill you ask? Well, for some reason I have radishes in my head as an eastern European item. I could be totally wrong, and probably am. And for me, eastern Europe and dill go hand in hand. That’s why the dill. Besides, the two flavors just combine deliciously. Have you ever roasted radishes or cooked cucumbers? 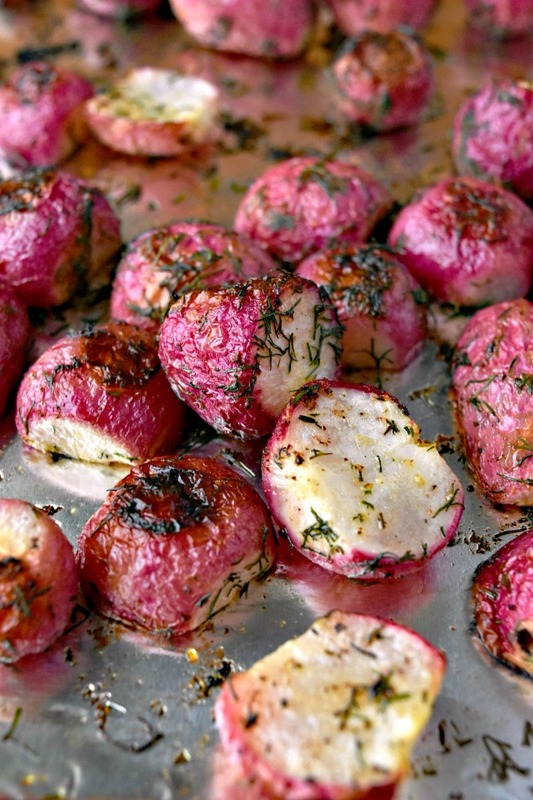 Roasting radishes changes their flavor completely! 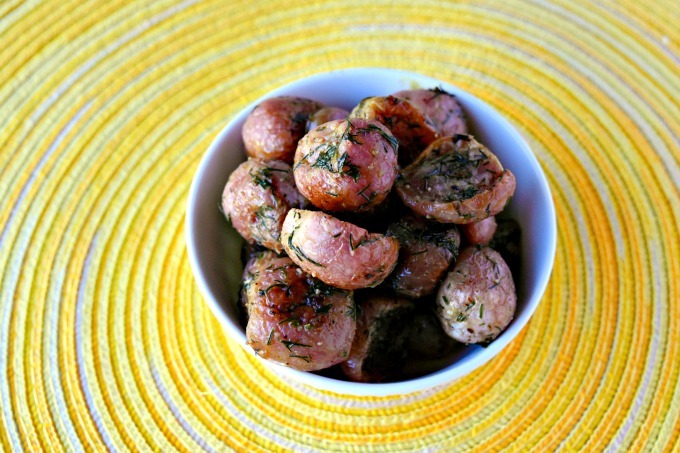 If you haven't roasted radishes, then try these Dill Roasted Radishes for a different side dish. Toss the radishes with the olive oil, dill, salt and pepper. Spread out on a baking sheet coated with aluminum foil coated with cooking spray. Bake at 425 for 15 to 20 minutes or until the radishes are crisp tender. Cool slightly before serving with for Easter. This week, thirteen bloggers are sharing 46 recipes and tips to help you serve up deliciousness this Easter. Follow #EasterRecipes on social media to see what we’re serving up! Dill always makes me think of spring dishes for some reason and those radishes are simply stunning. Great side dish for Easter. Thank you! I think dill is under-appreciated. I plan to use it more often. Ooooooh, yum! I roasted radishes for the first time last spring and LOVED them. Now I can’t wait to try them with dill! I hope you enjoy the dill with them. They’re delicious roasted! 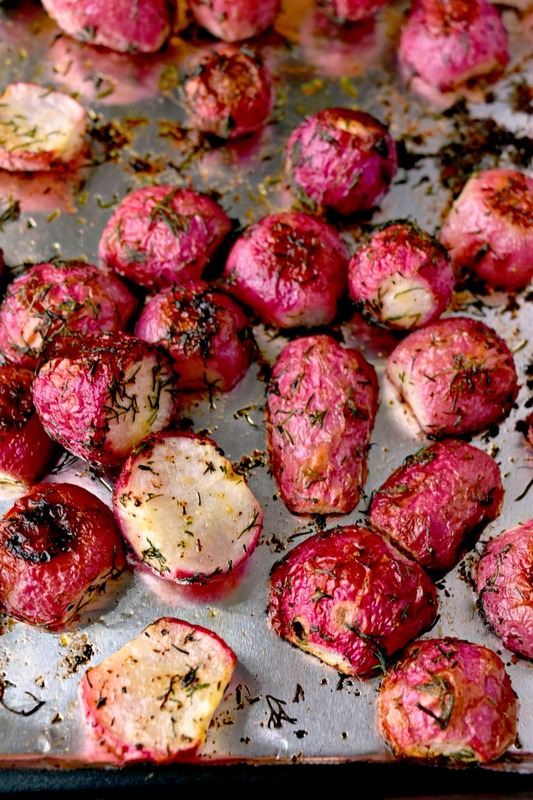 I love roasting anything with dill, and before seeing these beautiful photos, I probably would have never considered giving roasted radishes a try. Thanks for the inspiration! You’re welcome! They are very different roasted than raw. You just have to try it once. If you don’t like them raw, try them roasted. So different. What?! I had never thought of roasting radishes! I am going to have to try these with some of my garden radishes this summer. I can’t say enough how different the flavor is when you roast them. Try it! This looks interesting. I’ll have to make a small batch for me since I’m the only one who likes radishes. Dill is one of my favs too. You never know…. they REALLY are different roasted.